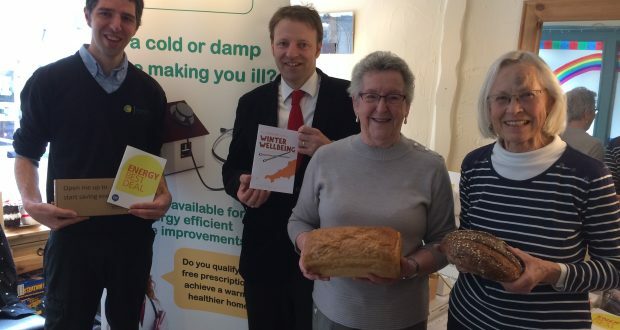 Visitors to Helston’s Open Door Café were given advice to help them to take control of their energy bills at an event to mark National Fuel Poverty Awareness Day on Friday 17th February. Cornish charity Community Energy Plus joined forces with the Helston and Lizard Food Bank to host a drop-in event for local residents to find out about grants and initiatives which can help them to enjoy warmer homes, tariff switching and advice on how to save energy and further reduce their bills. The event was held on National Fuel Poverty Awareness Day as part of the charity National Energy Action’s Warm Homes Campaign. The campaign aims to raise awareness of the problem of fuel poverty and some of the solutions available for those struggling to heat their homes affordably. In Cornwall fuel poverty currently affects 14% of all households, which is above the England average of 10%. A household is classed as being in fuel poverty when its fuel costs are above the national average and if they were to spend that amount, the money they were left with would tip them below the official poverty line. Householders can access free advice from Community Energy Plus to help them reduce their energy bills by calling the charity on Freephone 0800 954 1956.